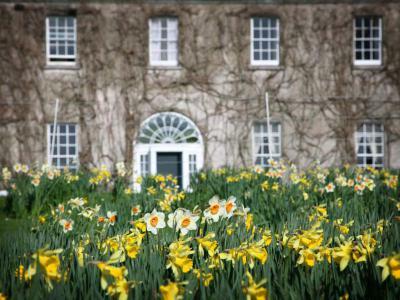 Enjoy a night in Ballymaloe House with Bed & Full Irish Breakfast. We offer three room types, Standard, Large & Superior, these rooms are in the main house & we also have charming rooms in a lime washed, rose-covered farm building in the courtyard. We offer some large and airy with beautiful views over the fields as well as cosier rooms at the top of the house in the eaves. Our newer, light filled garden rooms are at the back of the house and look on to the river and oak and horse chestnut trees beyond. As a resident, we automatically reserve a table in the dining room for you at 8pm each evening of your stay. Monday to Saturday we serve dinner from 6:30pm to 9:30pm. The menu changes daily and varies depending on what is in season at the time. Our food is sourced from our garden & local suppliers. It is a set five course meal and each course offers five or six choices. There is always a vegetarian option. Sunday night buffet starts at 7pm with a hot soup followed by a wide selection of fish and meat patés, shellfish (clams ,cockles, mussels, crab, shrimps and lobster as available), locally smoked fish (mackerel, wild salmon, hake ), home-produced vegetable salads and freshly cooked local meats (beef, pork, turkey, ham, lamb, ox tongue etc). After enjoying everything the buffet has to offer, the Ballymaloe Dessert Trolley will be brought to your table. The buffet is a house specialty and served by the Allen family, as they have done since Ballymaloe House opened in 1964. Dinner is €70.00 per person.